ANNUAL EXHIBITION – 2019 will see the 31st exhibition presented by CMRCI. Further information about the event is on the Expo tab. The CMRCI undertakes visits to retirement homes mainly to provide entertainment and an element of interest to the residents. 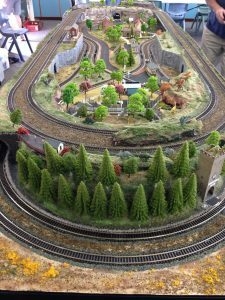 We also take our layouts to church and school fetes, markets, etc, again to provide a form of entertainment, but also to arouse and increase public interest in the hobby. Providing information to potential members is also an aim, albeit secondary. The Club takes either our children’s U-Drive layout, or our large exhibition layout, depending on the space available and the audience. The reaction by both children and adults to the layouts is universally good. 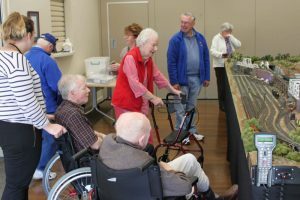 Members showing off our wares at a local retirement village. 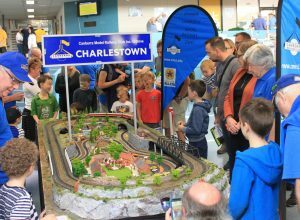 CMRCI has produced a children’s U-Drive layout, named Charlestown in in honour of, and to remember our long time member and friend Charles Schuster, who passed away in 2017. Charlestown was formally launched at the Club’s Expo on 24 March 2018 by Janet Schuster and Ms Suzanne Orr MLA representing the ACT Government who provided the grant that enabled construction of Charlestown. Charlestown is leading a busy life with appearances at school fetes, etc and at the Bunnings Majura Christmas event. The layout will be a primary promotional tool at various markets and events in the period leading up to our annual exhibition. The Mentor Program, which is a partnership between CMRCI and the University of Canberra High School, Kaleen, has entered its eighth year of operation – an achievement of which we are proud. The team has been working throughout this year on a major re-structure of the “Iron Rock Pass” layout. The mountains (once more like molehills) really look like impressive mountains, and the formerly rather placid stream is now a real mountain stream, with waterfalls and rapids. We comfortably predict that rafters will take up the challenge of its waters before Expo 2019 in March 2019! Students have had a major part to play in restructuring the scenery – mountain building, stream building, painting and ground-cover addition, as well as improving the rail track right-of-way. A snow shed has been added and its worth is plain to see by protecting the track against rock falls and heavy snow. Some track re-alignment will take place when school resumes for the 2019 school year, and the bridges (now glaringly missing) will be reinstated by the railway engineering crew. The fiddle yard has point motors installed, together with a new push-button control panel. Wiring still needs completion and testing, but the job is about 90% finished. Several students have learned soldering techniques, never having used a soldering iron before. With only about 6 school weeks in our Mentor Program in Term 1 before EXPO, students will be learning train operation skills ready for the layout’s first showing since its major overhaul. The student team will be keen to demonstrate their skills and to talk about their involvement in the program at EXPO on the 30th & 31st of March, 2019. A waterfall on Iron Rock Pass – Snowmelt is well under way at “Iron Rock Pass” and the bridges are out. A busy time lies ahead for the track and bridge crew! Provide students in the program with the opportunity to relate well to older people with real-life experience. Build student self-confidence and self-reliance. Develop student teamwork and team achievement in a structured program. 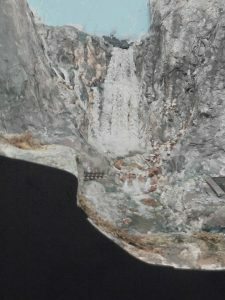 Develop skills in the use of tools and techniques that they may not otherwise experience, using model railways as a means of achieving this. Introduce students to applications of computing and electronic technologies and to build both experience and confidence in their use. 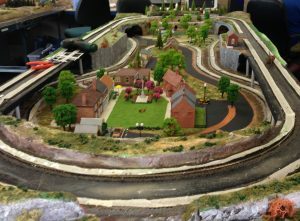 Encourage, in those students interested, an involvement in model railways as a life-long hobby and recreation. 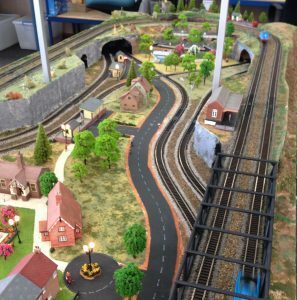 Provide an opportunity for the team to showcase and publicise their achievements at one or more Model Railway exhibitions or Expos during the time of their involvement in the program. CMRCI attended the Wagga exhibition again this year in what is becoming an annual event for us. Most of the crew were able to get to Wagga on Friday 2nd November by mid-afternoon, after an easy run from Canberra. 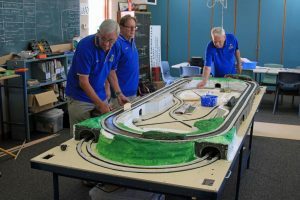 The set-up was trouble free and fast – the usual gremlins made only a token appearance and the layout ran well all weekend. 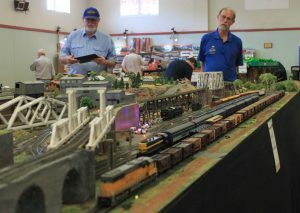 As usual, the exhibition was efficiently managed by the friendly Wagga Wagga Model Railway Club and it was a fun weekend for exhibitors and traders. There were about a dozen layouts exhibited ranging from small to large. The CMRCI members enjoyed the event and interaction with visitors and other exhibitors. Takedown was quick and efficient and members were well on their way back to Canberra by 5.00pm. 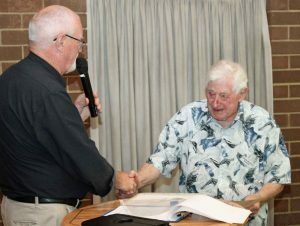 CMRCI members celebrated a busy and successful year at a club Christmas dinner in early December. About 50 members and guests attended the relaxed and well managed event. 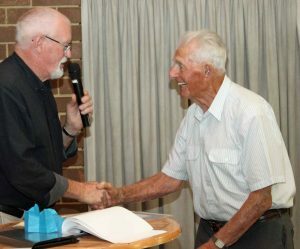 The President took the opportunity to present Life member awards to two CMRCI members on the grounds that they had reached their 90th birthday and are still active model railwaymen. Both men are actually well past a mere 90 years of age.